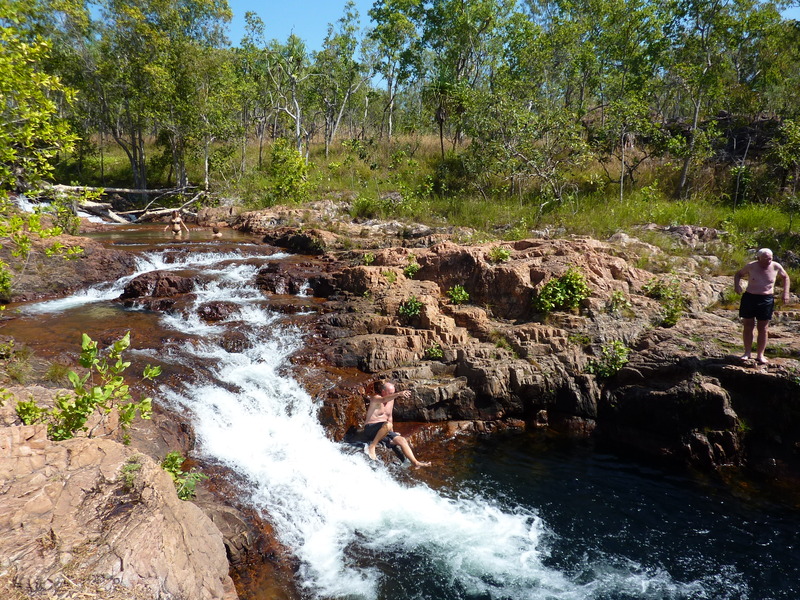 Another wonder around 130 kms from Darwin is Litchfield National Park. 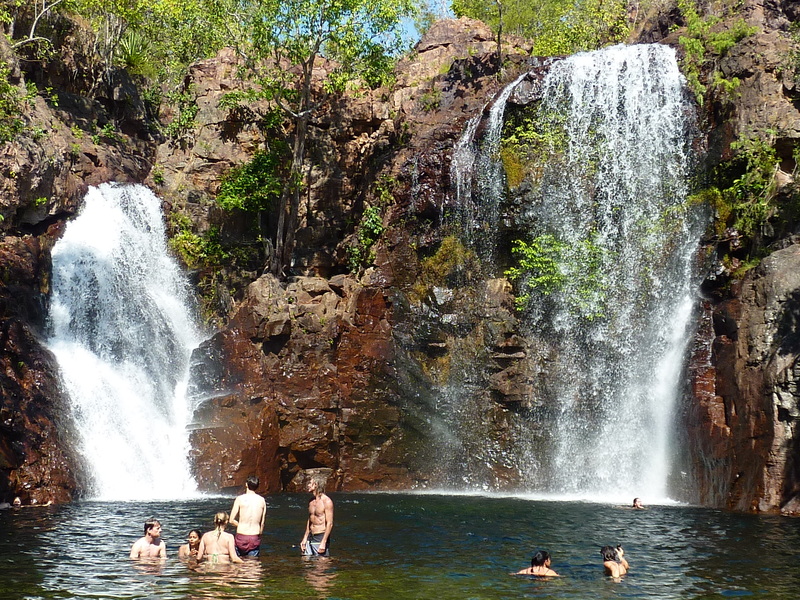 Firstly we went to Florence Falls, and had a swim. Beautiful Florence Falls, powerful enough to knock sunglasses off your head. 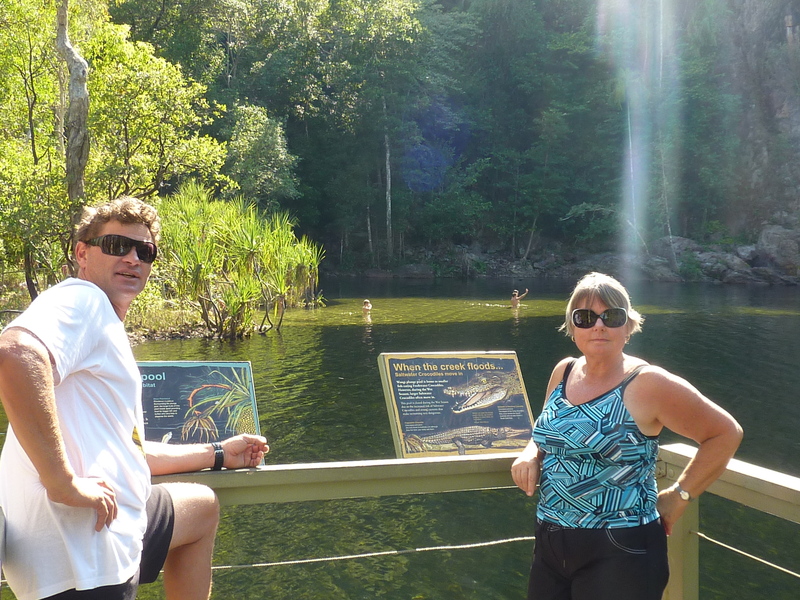 Kelv and me overlooking Florence Falls in Litchfield. 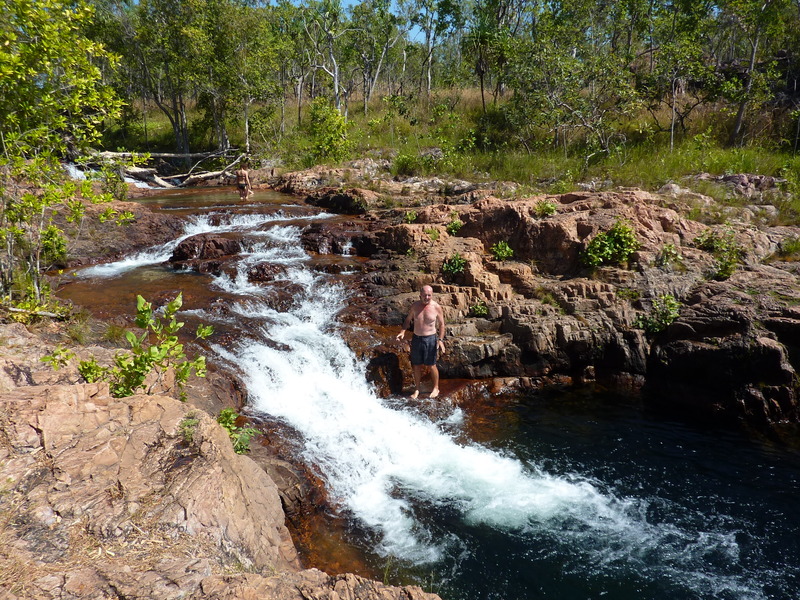 Here Kelv went under the water fall on the right with his sunglasses on. The power of the water knocked them clean off his head. We seconded the assistance of a couple who had water goggles on, and once located it was simply a matter of finding someone else with enough strength to dive down far enough to retrieve them. It was a joint effort by several strangers, but I get the feeling they all felt as elated as we did when the sun glasses were successfully retrieved. 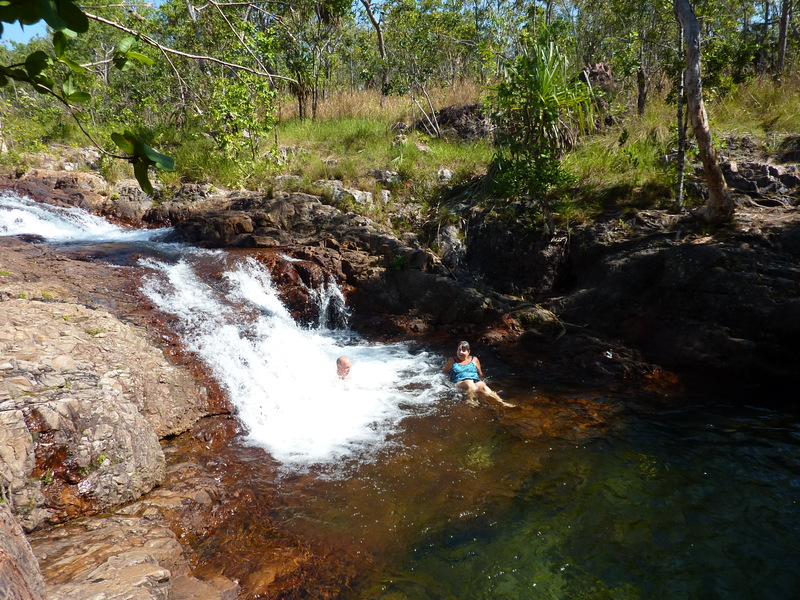 Next we went onto Buley Rockhole, a series of small waterfalls that provide the perfect swimming spot, or as we found out the perfect place for the best water spa massage ever. Decision made, Paul decides it’s worth trying out. Paul getting pounded, but not for long. I edged my way over and pushed him and out. On our exit from the park we called into the area full of magnetic termite mounds. Apparently, the termites detect the magnetic pull of the earth and build their mounds in a north south direction, with the slimmest sections catching the hot north sun. It’s an eerie looking place, resembling a graveyard full of head stones. Nature provides so many more fascinating spectacles than man ever could. This is just one more of them. 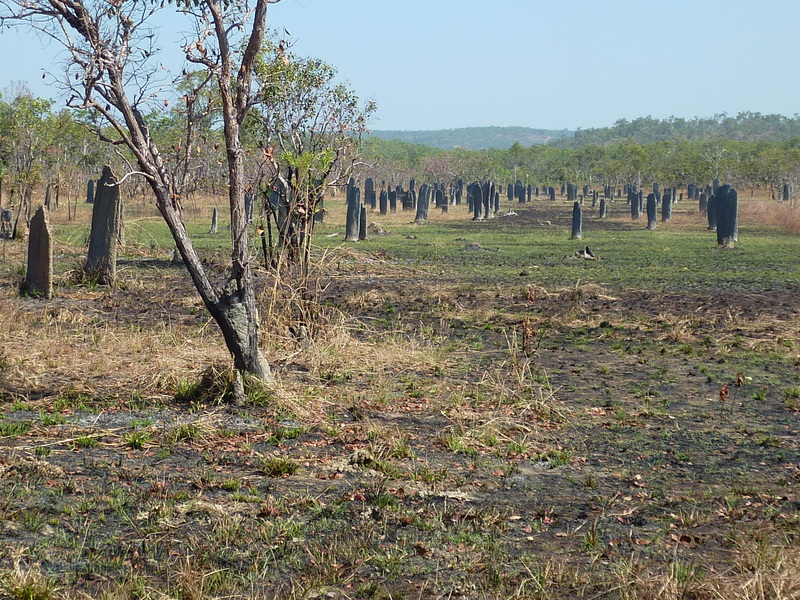 Not a graveyard – magnetic termite mounds.